DS 457 Series - Delivering extraordinary speed! 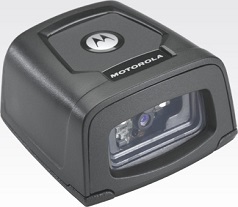 The Motorola DS457 Series delivers fast, high-volume hands-free scanning of virtually any bar code — including 1D, 2D and direct part marks. No matter what type of bar code is presented, or whether it is printed on paper, etched into a product or displayed on a mobile phone screen, the DS457 Series provides fast, accurate scanning in a tiny footprint that fits in the most space-constrained areas. Diverse series that can meet any fixed mount hands-free scanning need like — 1D, 2D, DPM and PDF417 bar codes, driver’s license parsing, still images, video and OCR. Packed with powerful 624 MHz processor, fast sensor shutter speed and patent pending fast-pulse illumination to deliver extraordinary scanning speed on all bar codes and increase productivity. Fits almost anywhere; suitable for design-conscious retail stores and other customer-facing areas. Easily mount wherever needed — on cash registers, under counters and more. No need to align bar code and scanner; improves ergonomics and user comfort. Bright central dot ensures quick, accurate scanning — even in bright sunlight. Can be used in either presentation mode for hands-free scanning or on-demand scanning via integrated scan trigger.